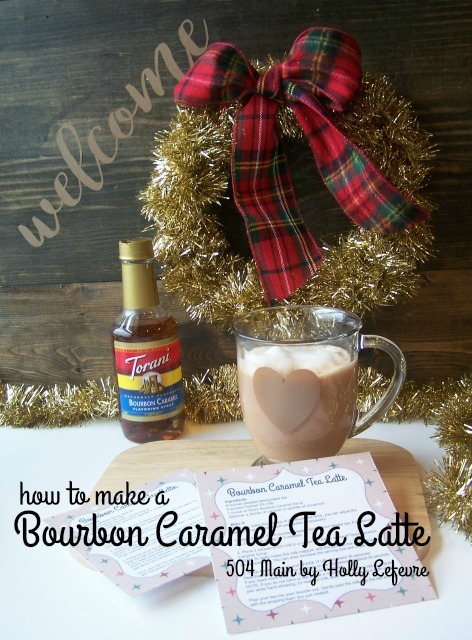 I enjoy spending time with friends but after moving to Texas a couple years ago, I sort of hibernated, but now I am ready (yep, it took awhile) to jump back into the social scene and I'm starting by inviting the neighborhood ladies over to share my new favorite drink of the season, The Bourbon Caramel Tea Latte. I know that during the holidays everyone seems to get caught up in busyness...but surely we all can find a few moments to gather this holiday season and reconnect over a delicious flavored drink, right? Torani makes it effortless to do just that, and I mean I never say no to a yummy beverage. We use Torani syrups all the time in our house - even in our lemonade and on our snow cones! My kids are big fans of the fruitier flavors, but I was looking for something different for the holiday season. 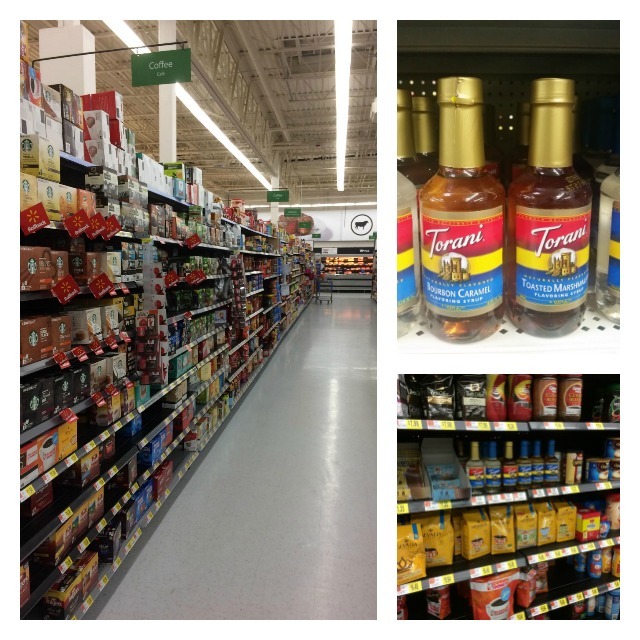 During this shopping trip to Walmart, I found my inspiration in the coffee aisle. First I picked up the Toasted Marshmallow syrup, but then I spied it...Bourbon Caramel! I knew this was the one. 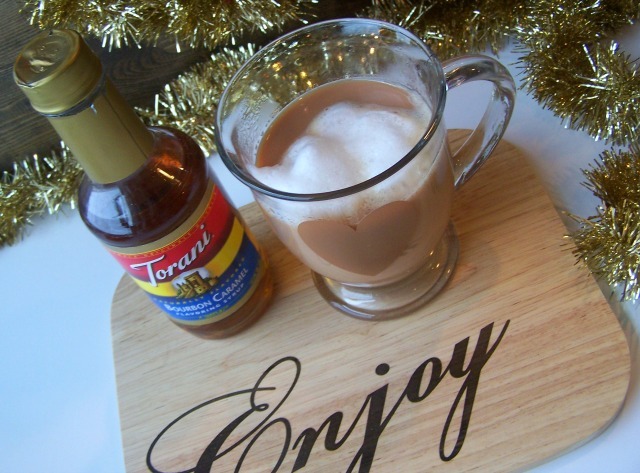 Torani's authentic coffeehouse flavors make it so easy to please your guests - just a splash of syrup adds so much flavor to your favorite hot or cold beverage. I grabbed a couple bottles of the syrup, black tea, and milk...and headed home to magic some magic! Now, back to my inspiration. I chose the Bourbon Caramel flavor because I wanted to create a sophisticated and inspired beverage. Torani is 3rd generation family owned since 1925, and the syrups are made with real, simple ingredients, like sugar cane. 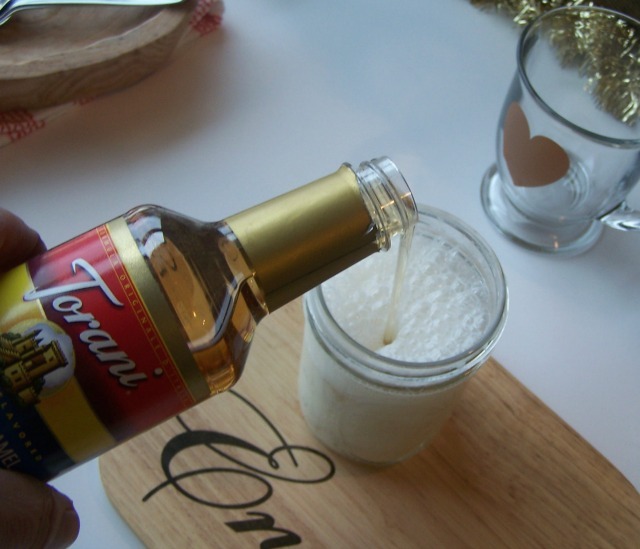 You know what they say "Great recipes begin with great ingredients," so I knew Torani was the perfect choice for adding flavor to this new favorite beverage or any beverage throughout the holidays. 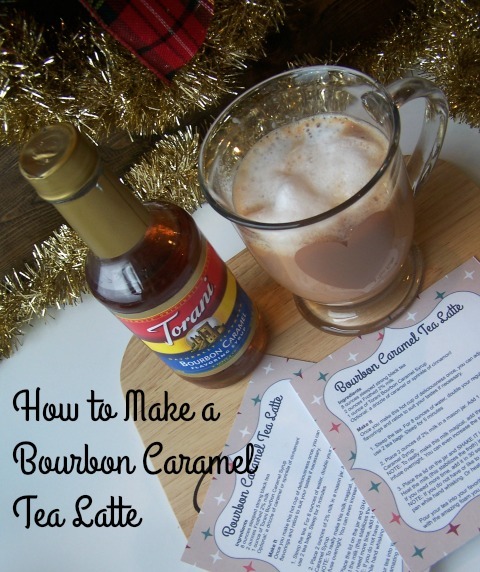 This Bourbon Caramel syrup did not disappoint. While it is non-alcoholic, Torani perfectly captured the essence of bourbon - the scent and the taste are intoxicating (with out being intoxicating)...and the hint of caramel makes this syrup pretty perfect...in my opinion! 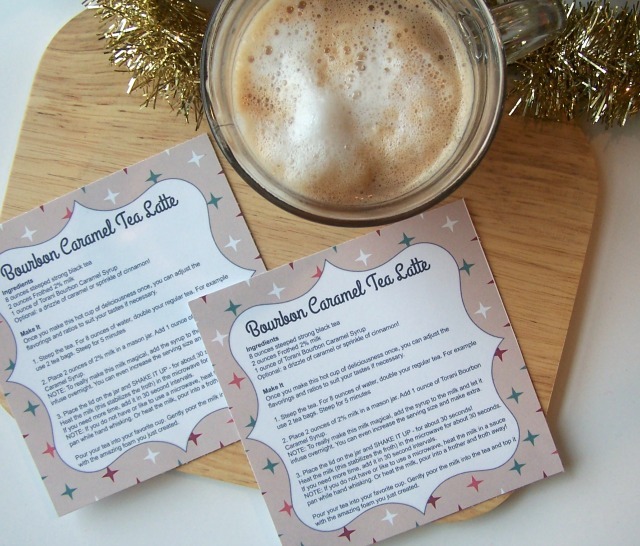 This tea latte has a warm, rich flavor that perfectly lends itself to entertaining. I bet if I keep whipping up new and tempting tea and coffee beverages using the Torani flavored syrups, the ladies will be coming back for more! 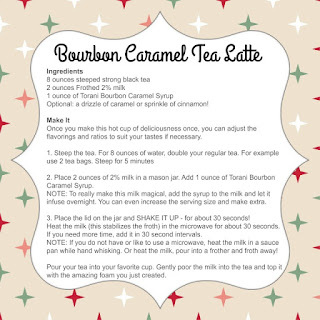 Now, lets make a Bourbon Caramel Tea Latte! Ingredients (one serving) - Grab a recipe card! NOTE: After you make this hot cup of deliciousness, you can adjust the flavorings and ratios to suit your tastes. Sometimes you only want a splash of flavor and sometimes you want more! It's so easy to personalize your drink with the flavored syrups. Steep the tea for 5 minutes (my husband swears that 3 minutes is the key, but I like 5!). 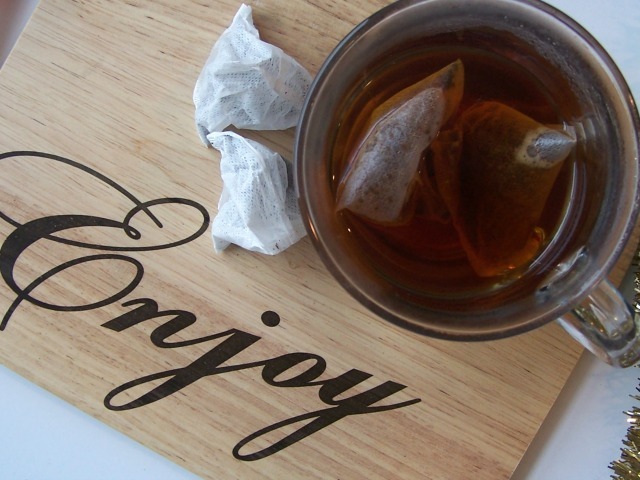 For 8 ounces of water, double your regular tea (For example use 2 tea bags). 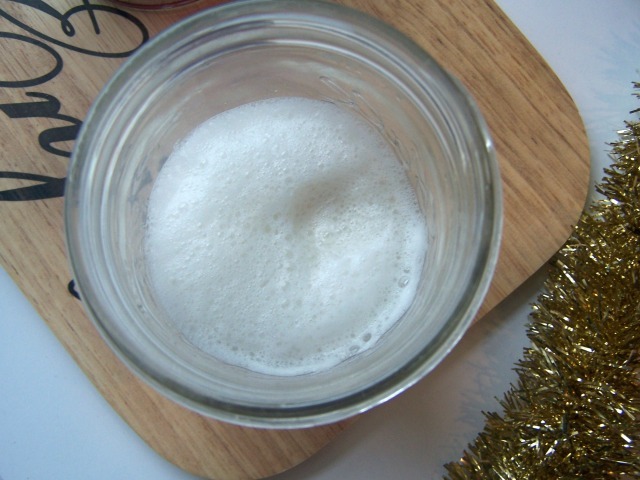 Place 2 ounces of 2% milk in a mason jar. 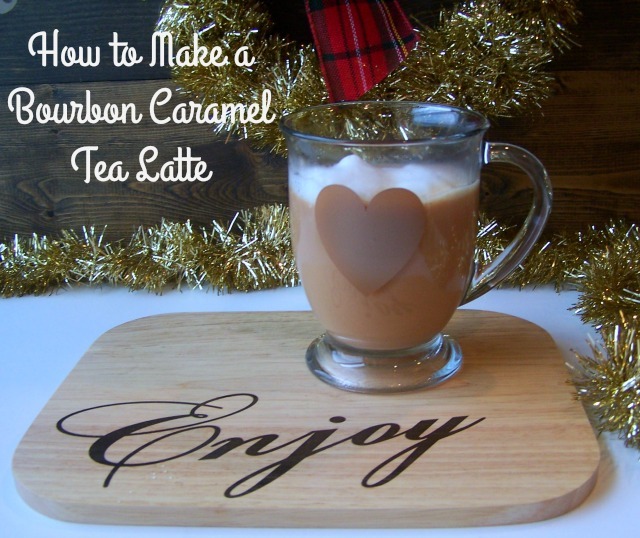 Add 1 ounce of Bourbon Caramel Syrup. This infuses the syrups flavor into the milk. creams froth and foamy goodness. NOTE (and you really should read this): To really make this milk magical, add the syrup to the milk and let it infuse overnight. You can even make a bottle full of milk so that you have it on hand whenever you are ready for a tea latte. Just adjust the measurements accordingly, at a 2:1 ratio. Place the lid on the jar and SHAKE IT UP VIGOROUSLY - for about 30 seconds! REMOVE the lid and heat the milk (this stabilizes the froth) in the microwave for about 30 seconds. If you need more time, add it in 30 second intervals. NOTE: If you do not have or like to use a microwave, heat the milk in a sauce pan while hand whisking. Or heat the milk, pour into a frother and froth away! 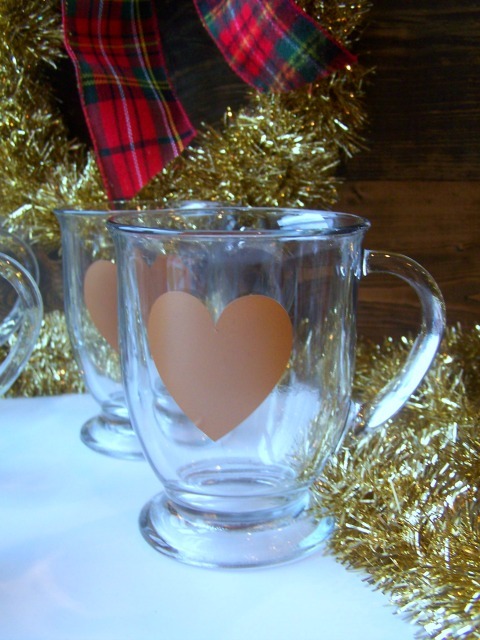 Pour your tea into your favorite cup. Gently poor the milk into the tea, stir, and top it with the amazing foam you just created. It's like a fancy coffeehouse (or tea parlor) in your own home. Now, let's talk about my little gathering! I created a cozy set up for our modern tea time. I let the syrup be my guide - that beautiful golden color is festive and decadent and was the perfect inspiration for my party and the little details. And for a little whimsy and sparkle, I made a metallic wreath. I wanted to keep the gathering cozy and nothing does that better than plaid, so I embellished with a big bow in my favorite color - Plaid! 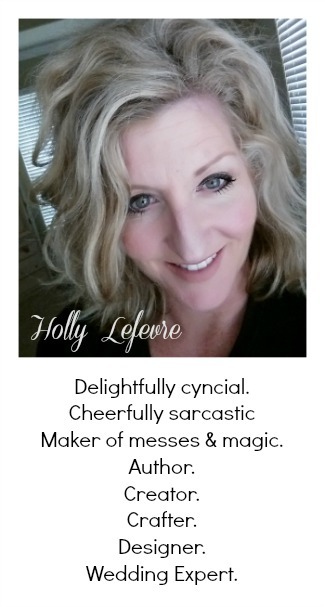 When I go to a party and taste something amazing, I always ask for the recipe, so, voila! Recipe cards each guest can take home. While we are speaking of recipes...remember that Toasted Marshmallow Syrup I mentioned up above...well, do I have an amazing recipe coming up using it. Decadent and creamy and chocolaty, because marshmallows and chocolate go together perfectly, right? 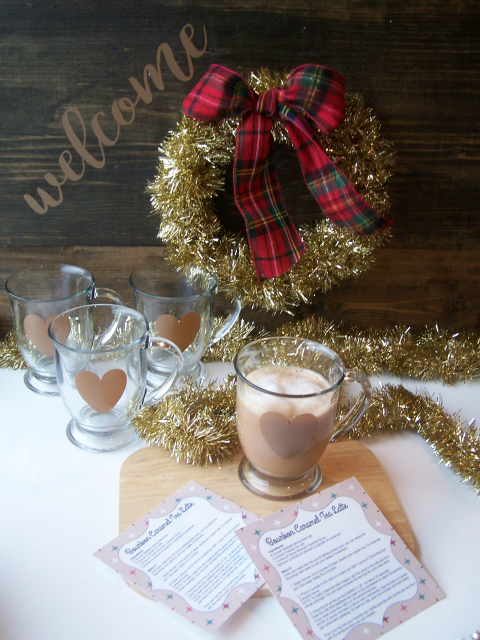 Simple party details inspired by my new favorite holiday beverage, the Bourbon Caramel Tea Latte, and making new friends - that is what the holidays are about! 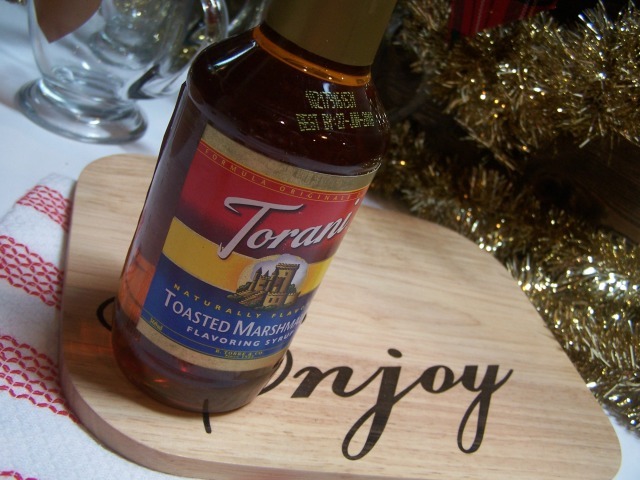 What drink would you make with Torani syrup? Do you have a favorite syrup flavor? This looks delicious and a must try! Shared and pinned!